PATEK PHILIPPE REF. 3567 WHITE GOLD Philippe, Genève, No. 1179629, case No. 2751081, Ref. 3567/1. Made in the 1960s. 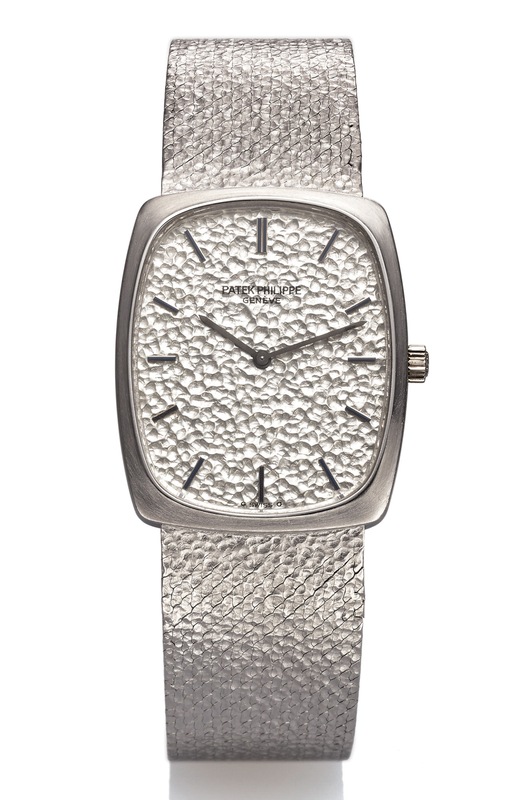 Fine and rare, tonneau-shaped, thin, 18K white gold wristwatch with an 18K white gold Patek Philippe hammered mesh bracelet. Two-body, solid, polished and brushed, sapphire crystal. Hammered white gold with applied white gold baton indexes with black inlay. White gold and black baton hands. Cal. 175, stamped with the Seal of Geneva quality mark, rhodium- plated, fausses cotes decoration, 18 jewels, straight-line lever escapement, Gyromax balance adjusted to heat, cold, isochronism and 5 positions, shock absorber, self-compensating free-sprung flat balance spring. C. Two-body, solid, polished and brushed, sapphire crystal. D. Hammered white gold with applied white gold baton indexes with black inlay. White gold and black baton hands. M. Cal. 175, stamped with the Seal of Geneva quality mark, rhodium- plated, fausses cotes decoration, 18 jewels, straight-line lever escapement, Gyromax balance adjusted to heat, cold, isochronism and 5 positions, shock absorber, self-compensating free-sprung flat balance spring. Dial, case and movement signed. DIM. 26 x 32 mm. THICKNESS 5 mm. Approx. overall length 185 mm.